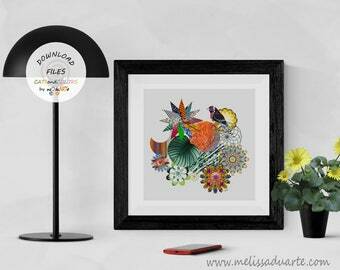 Printable Art Original and Unique by mel duARTE. Announcement W e l c o m e - t o- CATSandCOLORS. Art you print yourself. Simply download, print and hang! W e l c o m e - t o- CATSandCOLORS. 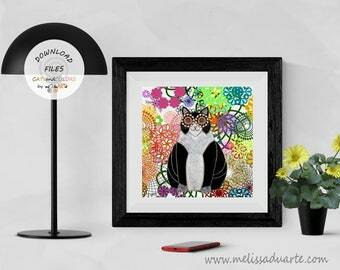 I'm mel duARTE, the designer and owner of CATSandCOLORS. All of my Prints have been created and designed by me, digitally by hand. My work combines painting, collage, photography, vector drawing and graphic design. All my work are the original pieces registered on the Bitcoin and Ethereum BLOCKCHAIN. ꙮ SIMPLY DOWNLOAD PRINT AND ENJOY! ꙮ ORIGINAL DIGITAL ART ON THE BLOCKCHAIN WITH CERTIFICATE OF OWNERSHIP AND AUTHENTICITY! Upon purchase, you'll be given the right to use, display (small size for internet),print, resell and transfer the creation for non-commercial purposes only. Since you own this unique creation, with the guarantee of a certificate of authenticity at Blockchain with your edition number, you can also resell the creation on a secondary market (non Etsy), always along with the transfer of ownership certificate. Files isolated without transfer of ownership registration can never be resold! For each certificate issued by the artist you have the right to a resale. If you wish to resell all limited editions of the work exclusively, you must purchase all limited editions and you will receive all Verisart Certificates from the Artwork (90 limited editions = 90 Certificates), so you can resell the work exclusively and always associated with the artist's name. Do NOT claim this piece of art as your own. You being a gallery or Art dealer will get a discount, please contact me! ⦁ 2. Small resolution JPEG file to share on the internet, not to print. As part of the transaction I will transfer the Verisart registration (The Certificate of Ownership and Authenticity with your edition number) to you so the chain of ownership is updated. In less than 24 hours, upon purchase, I will start the transfer of ownership process to your e-mail address provided by Etsy. If you are interested in purchasing the Token Art on Blockchain Ethereum, please contact me or visit my portfolio at Superrare and become an investor! Hi, my name is Melissa. I am a brazilian artist, living in Germany. I studied Web Design and self-taught painting, collage, illustration, photography and digital art. I love cats and I hope to make you happy with my art! To fulfil your order, you must provide me with certain information (which you authorised Etsy to provide to me), such as your name, email address, and the details of the product that you’re ordering. You may also choose to provide me with additional personal information (for a custom order, for example), if you contact me directly. Melissa Antunes Duarte Kuhnen, Alexanderstrasse, 24, Lorsch, 64653, Germany.